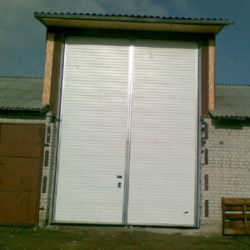 Industrial doors - built exactly for purpose. Many design options. 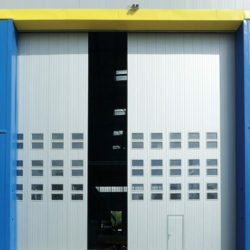 Industrial doors – built to serve. 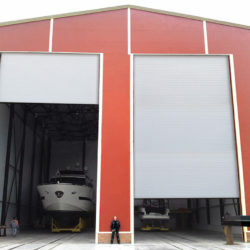 Ryterna manufacture several types of industrial doors. 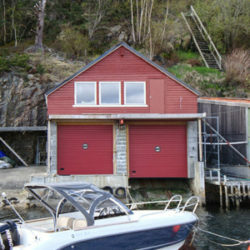 Each door we build exactly for its purpose. 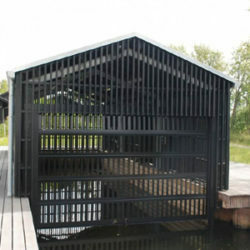 Of course durability and performance are key factors. But we care about door aesthetics as well. 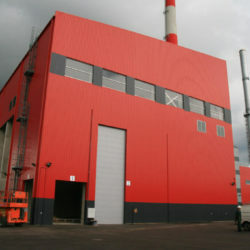 It is important how your industrial surrounding looks like. 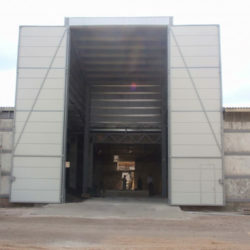 We specialize in designing and manufacturing large size special doors of various types. Each case is unique. 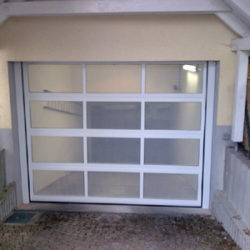 Therefore we are ready to help you choose right type of the door to get best performance. 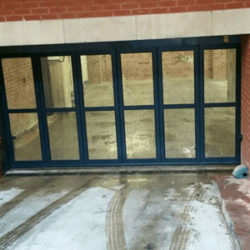 Sectional Doors is the most versatile type of the door. 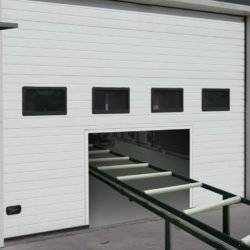 Made of 40 mm thick panels sectional doors are insulated, robust, easy to maintain and safe to operate. 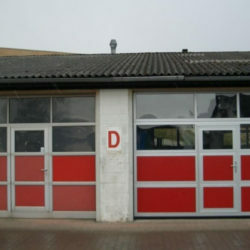 Sectional doors are the ‘draught horses’ serving industry for many years. 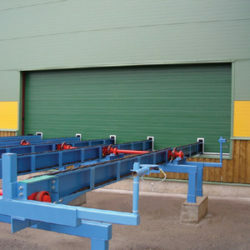 We can manufacture all track types including custom made. Standard torsion spring life time is 25,000 cycles. 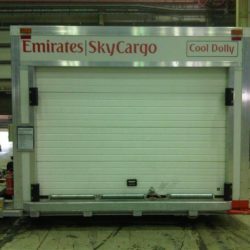 But for heavy duty and super heavy duty doors available 50,000 and 100,000 cycles life time springs. 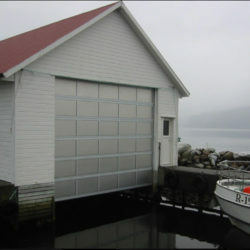 In addition for extra-large doors we can use direct drive gear without springs. 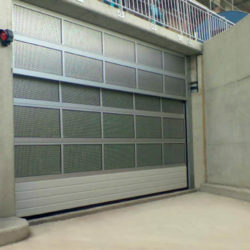 Doors with stainless steel hardware will match strict food processing industry requirements. 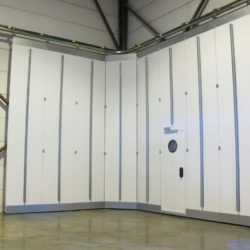 Max width 8,000 mm and max height 7,000 mm (larger sizes available – consult manufacturer). U-value 1.2 – 1.4 W/m2K. 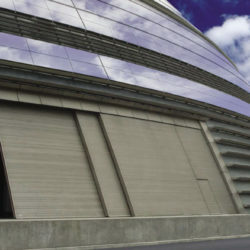 Noise reduction level -25 dB. 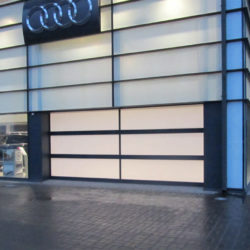 If you have to show something or want to be seen – consider Glazed Door option. 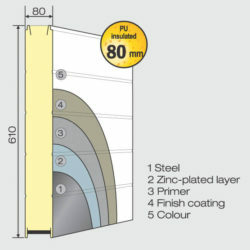 Aluminium profiles can be painted any colour including metallic finish. 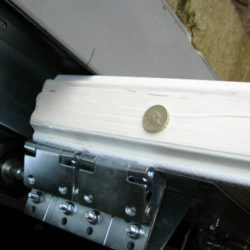 As option – Thermo-profiles with lower thermal conductivity. 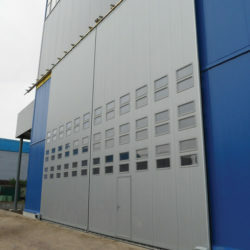 Max width 7,000 mm, max height 5,000 mm (larger sizes available – consult manufacturer). 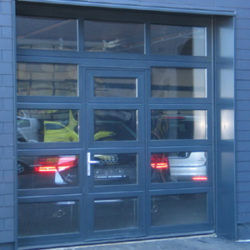 U-value – 3.7 W/m2K for door with standard profiles. 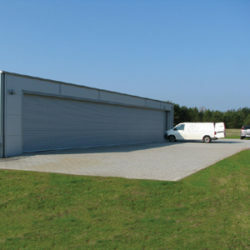 U-value – 3.4 W/m2K for door with thermo-profiles. 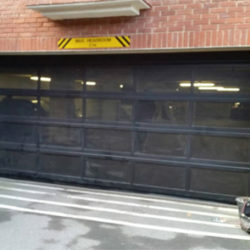 Doors for underground parking or storage premises where sufficient ventilation is required. 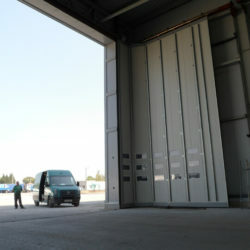 Doors with stunning 0.5 W/m²K U-value. 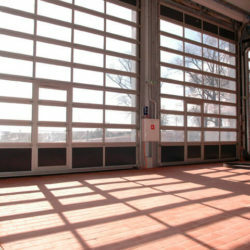 Ultra Thermo Industrial doors are for heated or refrigerated premises. 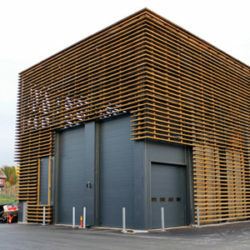 We manufacture Ultra Thermo using own 80 mm thick panels. 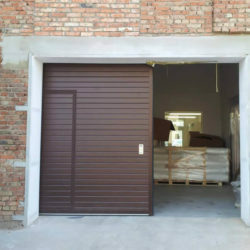 You can install doors between different temperature regime premises or as an external door. Door hung on straight guiding rail and riding along the wall. 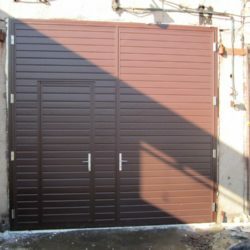 Door can be single piece or bi-parting. 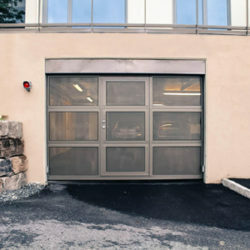 For extra-large openings ‘telescopic’ design is the solution. Round the corner doors on industrial scale. 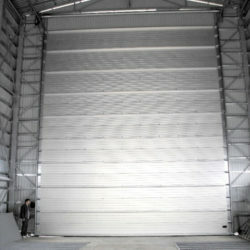 We manufacture extra-large size side hinged industrial doors. 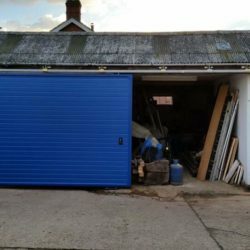 Accessories – full list of accessories. 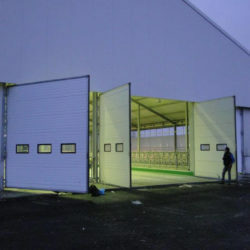 Technical data – industrial sectional doors specifications.